The older I get, the more I dread winter. Since my heart attack more than a decade ago I have been excused from any heavy-duty snow shoveling. I still operate the snow blower from time to time, but even that chore is now often handled for me by others. So snow removal is not the issue. Driving in snow is still bothersome, but it’s not such a big deal because I need only drive two miles to my bus every morning. No, the real issue is the cold. I can’t take it as well as I used to. Maybe I can blame it on losing 40 pounds of fat since last winter. Or maybe my heart medications have irrevocably thinned my blood. But after a week of sub-freezing temperatures I’m ready to move south. But since I still need to work for a living and work is in the windy, concrete canyon that is Manhattan, the best I can do is make a hot cup of coffee and look at pictures of warm places. In that vein, I was looking recently at some pictures I took of the Sonoran Desert in Arizona last year. I was reading that during the winter months, from November to April, the daytime temperatures in the Sonoran Desert range from 70°F to 90°F. That sounds extremely cozy for a January day. I wish I was there. As I mentioned, I visited the Arizona portion of the Sonoran Desert last year. This year, I plan to visit the California portion, which includes Palm Springs. While desert living used to be only for the extremely hardy, air-conditioning has opened up these areas to a lifestyle that is Nirvana to a cold New Yorker. Of course snow is not an issue except on the top of mountains. The fact that it rains only a few days a year means almost constant sunshine. Having a dreary winter day in the Northeast? Just dial up a webcam in the desert and you can almost feel the dry heat. 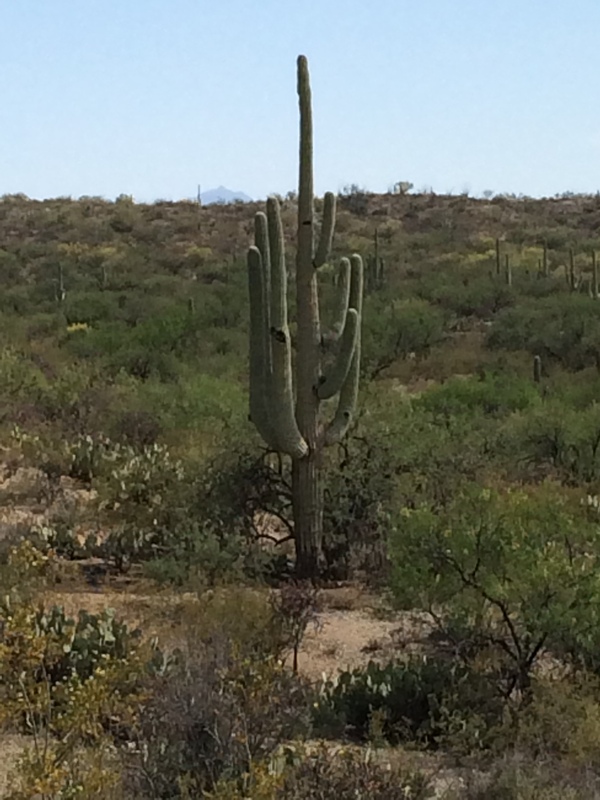 The other thing I do to conjure up the desert is to look at my pictures of Saguaro cactus. These are the large, iconic cacti that grow only in the Sonoran Desert.They live to be as much as 150-200 years old I found them really beautiful and surprisingly hard to the touch. Before I went to Arizona, I had always thought that these cacti were soft, but the Saguaro Cactus has a hard wood-like feel similar to a tree. And in fact, I was told that dead Saguaro cacti are often used as wood for construction of roofs and fences in Arizona. So as I endure yet another New York winter, my eye is on the calendar. Spring training begins in mid-February and the first pre-season Yankees game is March 4. After that, it’s a hop, skip and a jump until the first day of spring. Until then, I can huddle over a cup of hot something or other, look at pictures and think of the warm desert. California Dreamin’ on such a winter’s day. It may sound tempting, but I would spend a week or two in the desert in winter When we moved from Lodi to SoCal, we visited an aunt in Arizona on the way. The heat was unbearable. Yes, air conditioning helps, but who wants to live inside all summer. Then, in winter, there’s the opposite problem. Temperatures so cold and winds so howling, you might as well have stayed at home. I have been in Arizona at times when the cold was actually painful. There is no middle ground. The only seasons are summer, winter, and rain. Depending upon the year, fire could be added. If you want a never-cold locale. Try Mexico. During my visits, I’ve stayed in homes that don’t have glass windows, only grilles, because it never is cold. The only seasons I’ve been able to determine are sunny and rainy, without extremes either way.